Welcome back to another weekly update of the new cards for Cardfight!! Vanguard. We have even more cards for G-BT07 this week and also a little something for a new set but I’ll keep that a secret for now. Our first GR has been confirmed for us and he is amazing for his clan. Sunrise Ray Radiant Sword, Gurguit is the GR for Gold Paladin and he has a skill that requires Generation Break 2 and Unite. Once you have met these requirements you can Counter Blast 1 and Soul Blast 2 as an ACT for Gurguit to gain +5000 power for each of your rear-guard units, then each of your rear-guards gain +5000 power until the end of turn. The great thing is you can use this skill multiple times as long as you have enough of the resources but the skill won’t stay around for new units unlike Transcending the Heavens, Altmile’s skill. Luckily in the next set we get a few more cards that go into the soul. 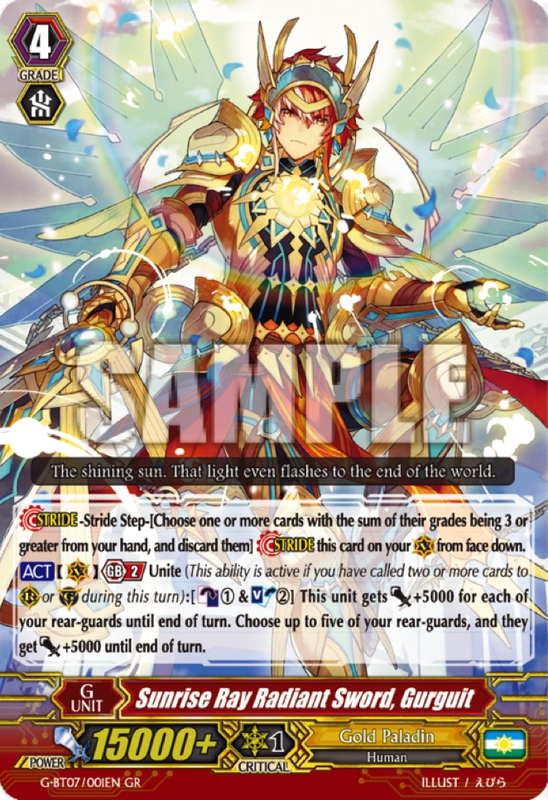 So far we know we are getting Knight of Blooming Sun, Jeffry; Knight of Thin Sun, Marcia; and Scarface Lion. Coel would also be a good starter to use as he goes into the soul and superior calls. All-in-all this is a great card and an amazing finisher. 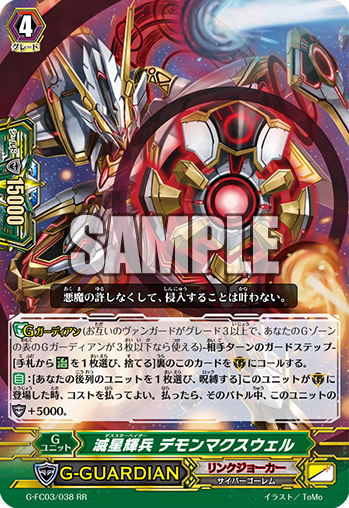 We also get some Ezel love with a younger version of himself, Wind Flame Lion, Wonder Ezel. This Grade 2 Ezel’s skill is activated when he is placed on RC and you have a Grade 3 Ezel Vanguard. It then allows you to search your deck for a Grade 3 Ezel and ride it. This can help you patch up the cross ride early by riding Platina Ezel over Blond Ezel, and will let you easily get a powerful Raven Haired Ezel on the field. Snow Elemental, Hjaco is said Cray Elemental and is a Grade 1. On the RC he has an ACT with GB1 that has you bind two copies of him from the field to choose one of your Vanguards and if that Vanguard has a skill which requires you to CB 4 or more AND SB 6 or more then that skill becomes free until the end of the turn. Make sure to remember that the skill must have both the CB cost and SB cost in order for this to work. So not only does this make Square One Dragon’s cost free but it also does the same thing for the old Megablasters. 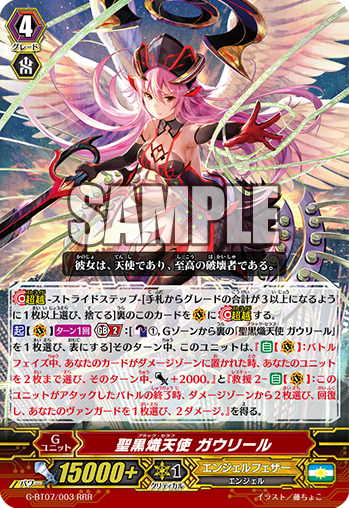 People can now more easily use the Doppel Vampir and Stil Vampir combo to stop your opponent’s Vanguard from guarding from hand, though I feel Agravain gets the most out of this card, as well as helping the Amaterasu legion out. 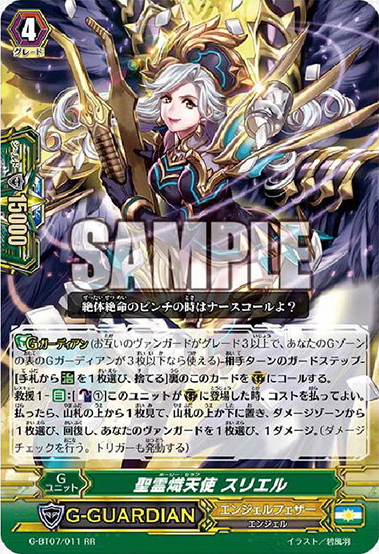 Black Seraph, Gavrail is a new stride for Angel Feather. As an ACT you can CB1 and G Persona Blast and she gets a skill that will give two units +2000 power when a card is put into your damage zone during the battle phase, and after she attacks, you Rescue two units. This in combination with Nurse of Broken Heart, Million Ray Pegasus, and Thousand Ray Pegasus will be especially deadly, and the Rescue has a fairly good chance of getting a trigger for extra power. Gavrail also gets her Glimmer Breath clone with Black Dream, Zabaniya. With a GB1, CB1, SB1, and putting a card from your hand and put it into the damage zone. If you do then you can choose one face-up card from your damage zone and bring it onto the field, then Zabaniya gains +2000 power until the end of the turn. After that you Rescue one card. This is a pretty good buff to your Pegasi and Nurse of Broken Heart with putting two cards into your damage zone. Laser Clutcher, Ke’el and Drill Motor Nurse are a Grade 2 and Grade 1 that have the same effect. When these units are put in the drop zone from the damage zone then you can call these units to RC and if they were put into the drop zone due to a Rescue effect then they also get +3000 power until the end of turn. This makes Zabaniya an extremely good card as you can potentially superior call two units with a CB1 and SB1. 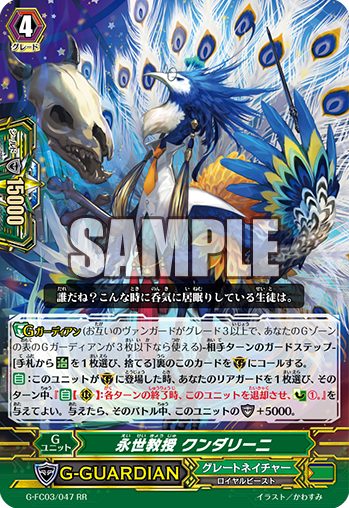 As for G Guardians, Angel Feather got a pretty sweet card in this set with Holy Seraph, Suriel. When she is placed on the Guardian circle you can CB1 to look at the top card of your deck and choose whether to put it on the top or bottom of your deck, then Rescue a card. The CB1 isn’t really a cost at this points as you can just Rescue that card and the check gives you a better chance of getting a trigger from the Rescue to give your Vanguard a +5000 power until the end of turn, then the damage also activates Gavrail and Nurse of Broken Heart to increase the defence further. You could also Rescue Ke’el then use her to intercept. Kagero also have a new G Guardian. Flame Winged Steel Beast, Denial Griffin can Counter Blast 1 to retire an attacking rear-guard when it is placed on the Guardian circle. This will help you against Silent Tom clones and Sanctuary Guard Regalie columns but more importantly Kagero will be able to fight back against Pale Moon’s Magia and also be able to do something against Great Nature and Granblue as Kagero can’t really do much on their own turn against these clans. If you combine this with Lizard Soldier, Bellog then you could retire the booster too, or the other front row rear-guard if they have already attacked with it. 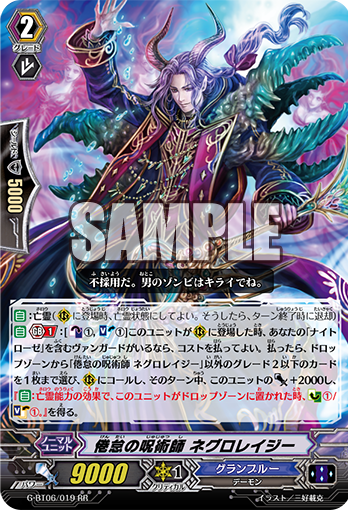 The last card for G-BT07 this week is Supreme Heavenly Emperor Dragon, Dragonic Blademaster “Taiten”. He has the Blaze keyword and as a once per turn skill, if you are on GB2 and you CB1 and G Blast, you can retire as many of your opponent’s rear-guards equal to the amount of Supreme Heavenly Emperor Dragon, Dragonic Blademaster “Taiten”s in the G zone. Then, if you’re Blazing he gains an extra crit. At best this card retires three and has an extra crit but at worst he is just vanilla, though the likelihood that you won’t be Blazing is slim so 9 times out of 10 you will get the crit. Now something very exciting is the next Technical Booster: The GENIUS STRATEGY. 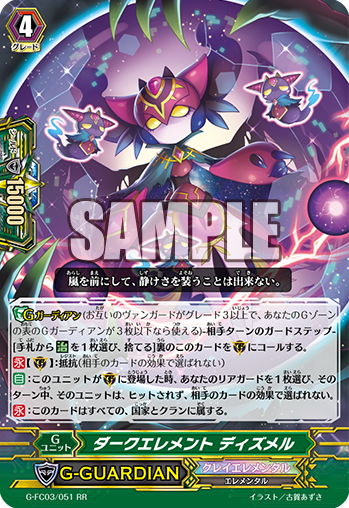 This booster will contain support of 25 cards each for Megacolony, Murakumo, and Great Nature. We have had a few cards revealed to us already which include reprints. These reprints are Coiling Duckbill; Castanet Donkey; Stealth Fiend, Lake Diver; Stealth Beast, Cat Devil; and Machining Stag Beetle. They will all also receive new artwork! A small amount of new cards have already been revealed including the new Yasuie card. 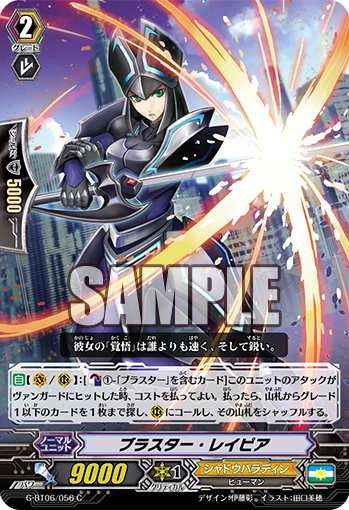 Ambush Demon Stealth Rogue, Yasuie Tenma has a new keyword called Shadowstitch which are skills that activate when an attack of one of your units did not hit. Yasuie Tenma’s skill requires a GB2 and a G Persona Blast to activate his Shadowstitch ability. When one of your units attacks do not hit when they were attacking a Vanguard, then you can CB1 to search your deck for one copy of the card that attacked and call it to RC. We will need to see future rear-guard support before we can see this unit’s true worth but at the moment it combos pretty well with Fujino and this skill can be used to clone the Grade 3 that is your heart. This is similar to the Catherine and Alice combo that Nightmare Dolls have and would be good to use if your opponent is on five damage. Hammsuke get some support after all this time with a new Grade 2, Hammsuke’s Schoolmate, Oil Pen Hammjiro. Hammjiro’s effect works on both VC and RC and at the end of the turn, if you have a Vanguard with Hammsuke in its name, at the end of the turn Hammjiro can retire one of your rear-guard Hammsukes and you get to Counter Charge 1. This works really well with the Hammsuke’s cloning effect which would usually cost CB1 but with this card it becomes free. Another form of Hammsuke support comes in the form of Hammsuke’s Schoolmate, Fountain Pen Hammkichi. As an ACT you can SB1 and choose a Hammsuke from the drop zone and put it at the bottom of the deck, if you do you can give two of your rear-guards +4000 power and then you have to retire them at the end of the turn. As well as all of that he can CB1 to gain +4000 power for every rear-guard you have with Hammsuke in its name, giving him a potential of gaining +8000 power. Lastly we have a Megacolony stride called Dazzling Mutant Deity, Waspytail. When Wasptail’s attack hits you can Soul Blast 1 and G Blast to choose one of your opponent’s rear-guards, and paralyse that rear-guard as well as all rear-guards in the same row AND column, giving you a possibility to paralyse four of your opponent’s units. If anything this will at least use up your opponent’s hand to guard and then you can sweep in with Stun Beetle. Join me again for next week for more spoilers on the latest sets, decks, and promos. Welcome back to another weekly update of the new cards for Cardfight!! Vanguard. This week we have a bunch more G Guardians for several clans with two being Cray Elementals. Dark Element, Dysmel is one of the Cray Elemental G Guardians. She has Resist which makes her a strong unit against Dimension Police, as well as that, when she guards you can choose one of your rear-guards and that unit cannot be hit and they gain the effects of resist, which will help you against Kagero, Narukami, and Link Joker. This can help out Royal Paladins if you play on G Guarding more than once in a turn because you will be able to use this to protect a Grade 2 for Laserguard Dragon‘s skill to give you a bigger shield. Another little trick with her, this time if you’re using a Glendios deck, is if your opponent is coming in for a crazy amount of power and crits, use Dysmel to stop one of your Reverse units from getting hit, then use Taboo Star-vader, Rubidium‘s effect to make the attack go to that Reverse unit and the attack becomes nullified. The other Cray Elemental is Metal Element, Scryew. When this unit is placed on GC you can discard a card from your hand and Scryew will gain +10000 shield. This will prove useful for decks that use many draw triggers as you can discard a 10k shield and a 5k shield to gain a 25k shield. Even if you discard another 10k shield that can help if you are against cards that will prevent you guarding from your hand like Dark Dragon, Phantom Blaster “Diablo” and Blue Storm Marine General, Despina. For Great Nature we have Immortality Professor, Kundalini. When he is placed on the GC you can choose one of your rear-guards to gain an ability that has them retired at the end of the turn to Counter Charge 1. If you give the rear-guard this skill then Kundalini gains +5000 shield. The great thing is you can then intercept with the chosen unit as it doesn’t need to be retired to get the extra shield. You could also use Stamp Sea Otter to avoid any of your rear-guards being retired from the effect, though then you wouldn’t get the Counter Charge. Or you could use Balloon Raccoon to ensure having a big shield the next turn too. Tachikaze get Iron Armor Chancellor, Dimor Phalanx. If you have less rear-guards than your opponent then this unit gains +5000 shield. This won’t do so well if you are using Ancient Dragons as they have a bit of a habit to bring their guys back from the drop zone but with the new G deck it works very well. 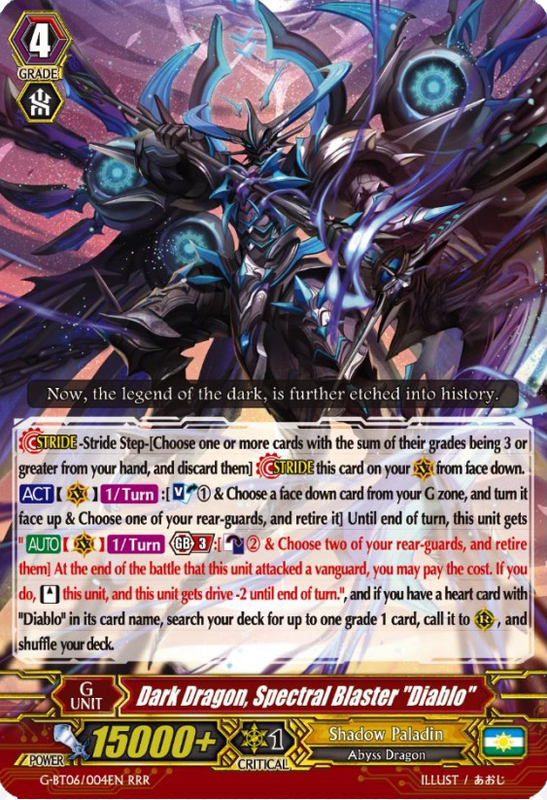 There are some decks that this may fall a bit short against, such as Shadow Paladins, Murakumo, and G Pale Moon. Though against most match-ups this card should be able to get his extra shield. Shadow Paladin’s Dark Knight, Ludwik allows for your rear-guards that wouldn’t normally be able to intercept to go into the GC. When he is placed on the GC you may choose one of your Grade 1 or less rear-guards and put it into the GC along with it. Ludwik does not gain any extra shield but can get you an additional 5000 shield, 10000 shield, or perfect guard (As long as you are using the old PGs) from his skill. This doesn’t really help with Witches apart from to use it with Goewin if you superior call her with Lir, but apart from that Witches would do better with the Cray Elementals for now. Continuing through the United Sanctuary we have the Angel Feather unit, Holy Seraph, Orifiel. She is a sort of limit break G Guardian that only gets the +5000 shield if you have four or more damage. It’s simple but you may want some Cray Elementals in there for early game or if you’re using Holy Seraph, Raphael and Dreamlight Unicorn. 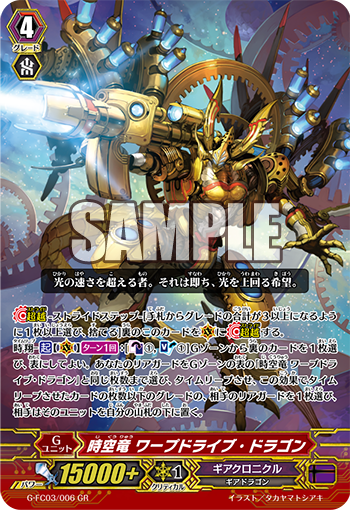 Finally Narukami with their very G-themed G Guardian, Lightning King Spirit Emperor, Vritra. He has a Thunderstrike 1 (Your opponent must have one card in their bind zone) that you must fulfill in order to get his +5000 shield. 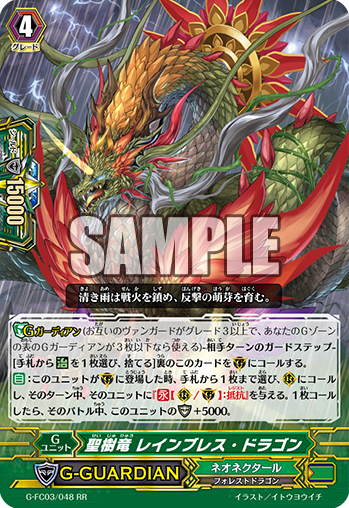 Luckily you can use this in many decks thanks to Voltage Horn but if you don’t have room for that then you probably won’t be using this in a non-G deck. Welcome back to another weekly update of the new cards for Cardfight!! Vanguard. Yet again there aren’t many cards to talk about this week but the ones we do get are very good. There are the last of the GRs and RRRs from Fighter’s Collection 2016, a new stride for the Daigo set, and info about the next clan booster. 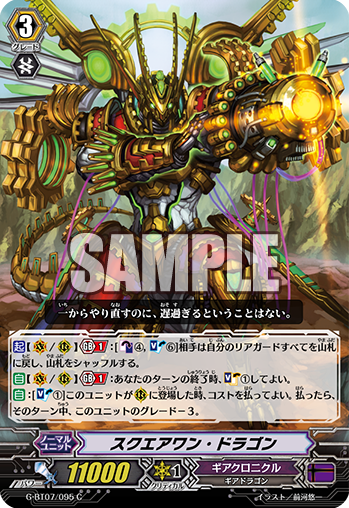 Interdimensional Dragon, Warp Drive Dragon is the GR stride for Gear Chronicle in the Fighter’s Collection and boy does he make a good early game and late game stride. It has an ACT cost of CB1 and SB1 and the option to flip another card G unit face-up. If you did the Counter Blast and Soul Blast then you can Time Leap as many of your rear-guards equal to the amount of face-up Warp Drive Dragons you have in the G zone, then choose one of your opponent’s rear-guards with a Grade equal to or less than the amount of cards you Time Leapt with this effect, then put that card to the bottom of their deck. There are some great cards you can select to Time Leap for early game like Steam Worker, Etana to get in some extra damage; Steam Maiden, Lasina-bel to mess with your opponent’s set-up; and having Tickaway Dragon during all of this will stop you from decking out and will ensure that you have the right cards to Time Leap to. For Aqua Force’s RRR they have Marine General of Heavenly Silk, Khristos who fixes up any weaker columns. When he attacks you may Counter Blast 1 to give your front row rear-guards +2000 power and they gain the abilities to draw a card if their attacks hit on either the third or fourth battle of the turn. This will work well with Magnum Assault and Battle Siren, Adelaide to keep your units stood, ready for the third and fourth battles, though it would have been nicer if the skill was wave fourth and fifth. Still, this will put pressure on your opponent and may force them to use 10k shields on fairly weak rear-guards. 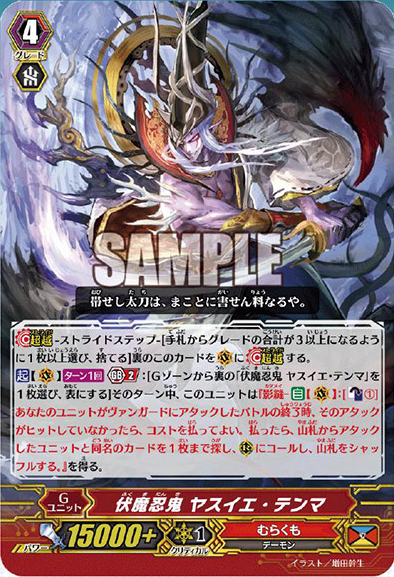 Shadow Paladin’s stride is Dark Dragon, Distress Dragon and he does what you would expect him to do, mass retirement. As an ACT you can CB3, SB3, and G blast 1, then you can choose any number of your rear-guards to retire and your opponent retires the same amount. Then if the amount of units retired in total was six or more you draw two cards, Counter Charge 1, Soul Charge 1, and your Vanguard gets +20k power. Retiring Promising Knight, David; Pitch Black Sage, Charon; or Mage of the Rogue Eye, Arsur can really hurt your opponent as they would have to retire two cards for you only retiring one. Having trouble with Grade 2 stallers? Wish you could get a stride without your opponent being at Grade 3? Well from the creators of Air Elemental, Twitterun, I have for you Air Elemental, Sebreeze! 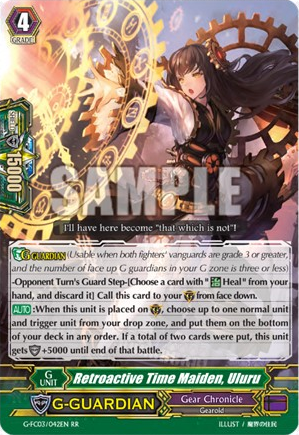 If there are no face-up cards in your G zone and you are at Grade 3 while your opponent is at Grade 2 and they didn’t ride on their previous turn, then you may stride this card. Having your opponent try to guard as a Grade 2 against this card and your GB1 rear-guards is going to prove extremely difficult for them, though I’m sure a lot of people won’t be using this just because they want their G zone to only have their clan in this, so you stall decks will still be safe against a few decks, though in competitive play it would always be good to have one of these in your G zone. I guess there’s only one thing for it… Grade 1 stall decks! For the Daigo set Holy Dragon, Sanctuary Guard Imperial was recently revealed. You may CB1 for it’s ACT ability to give one of your Grade 1 or less rear-guards +3000 power for each of your Grade 1 or less units, including itself. Then if that unit hits a Vanguard, your Vanguard gains +10000 power and +1 crit. Though Regalie may be a better option most of the time, Imperial does work well if your opponent doesn’t have many cards in their hand so you can get in as much damage as you can in one turn. Lastly there’s some exciting news for Bermuda Triangle players with the new G Clan Booster 3: Blessing of Divas. From the looks of it Lauris is our GR of this set. 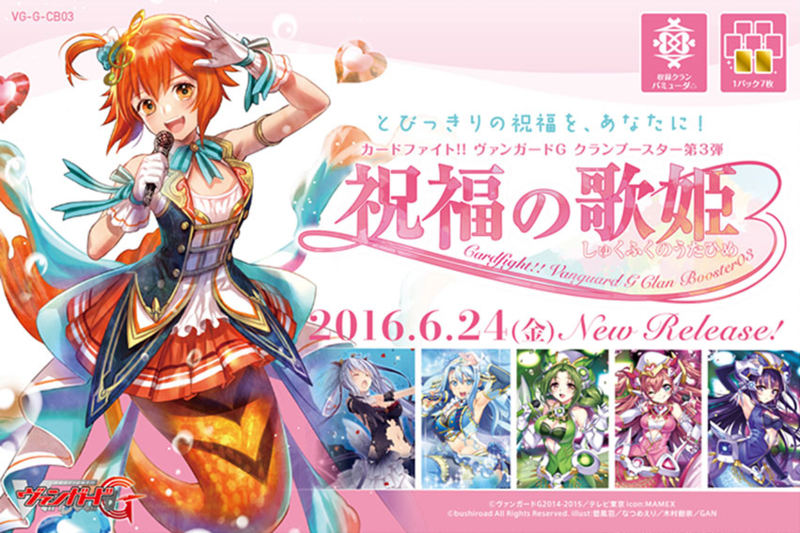 There also seems to be Raindear and Coral in the picture as well as the three on the end being a new PRISM trio. Not only that but we have confirmation of a new rarity for this set! If you remember the SPs from the last Bermuda set then you’ll know they had alternate art with a summer theme. Well in this one we still have the SPs but also WSPs. It’s expected that the SPs will just be the same art like most SPs but with the text border gone, though the “W” in WSP stands for “Wedding”, meaning you’ll get to see your favourite Bermuda girls in a wedding dress. Cardfight!! Vanguard has turned into a dating sim for your Bermuda waifu, I’m sure many will be pleased. Welcome again to the weekly Vanguard update. This week we have some Royal, Shadow, and Grablue reveals, as well as some extra stuff for later sets but I’ll talk about them as we go. People have been waiting a long time for the Shadow Paladins to get their versions of Blaster Rapier and Blaster Axe that were shown in the manga and we finally get them along with Blaster Dagger who people have also been longing to see. I will start with Blaster Rapier who’s skill takes effect on both the Vanguard and rear-guard circles. 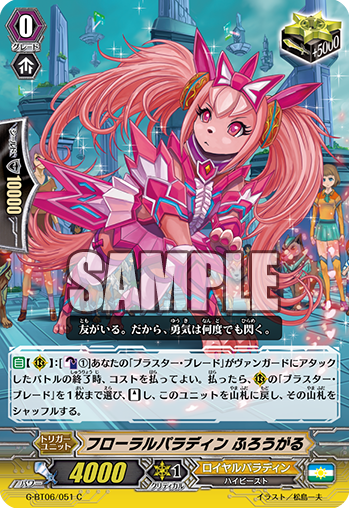 When her attack hits a Vanguard you can Counter Blast 1 with Blaster in its name to superior call one Grade 1 or less from the deck. This is a great card to ride seeing as a lot of people tend to take the attack from your Grade 2 Vanguard to save cards in their hand for later game, so this gives you a chance to fill out your field early. Another Grade 2 Blaster is Blaster Axe who, unfortunately, does not have a skill so he is only a 10k vanilla but it’s useful to have him to have a better chance of filling up the soul with Blasters for Gust Blaster Dragon. Lastly we have the young lad, Blaster Dagger. This 6k Grade 1 may not be the best choice if you’re going for the Gust Blaster build but may be better for a Phantom Blaster build. When he boosts another Blaster you can Soul Blast a Blaster card to have the boosted unit get a total of +11000 power. Whirlwind of Darkness, Vortimer “Diablo” had a skill that specified a certain unit, and now that unit has been revealed to us! Dark Dragon, Spectral Blaster “Diablo” is the new “Diablo” stride who, with a Soul Blast, G Blast (Flipping any G unit face-up), and retiring one of your units, gets an ability to superior call one Grade 1 from your deck if you have a “Diablo” heart and another ability that allows you to re-stand at the end of his battle if you Counter Blast 2, retire two of your rear-guards, and are on a Generation Break of 3, though he loses two drives of his Triple Drive. With Whirlwind of Darkness, Vortimer “Diablo” it shouldn’t be too hard to get the cards you need to retire and with Kahedin and Hoel it continues to make the retiring and Counter Blasting much more bearable. Blaster support and “Diablo” support.. what more could Shadow Paladins get in this set? Oh wait! There’s also some Claret Sword support and with G boss support comes Glimmer Breath clones. Graymyu is most closely related to Benizel in terms of skill. When he is placed on the Vanguard or rear-guard circle, if you have a Claret Sword Vanguard, then you may Counter Blast and Soul Blast to superior call a Grade 1 from your deck, then Graymyu gets +2000 power. This may seem a little underwhelming compared to the other clones but he is only a common making him very easy to get a hold of. The second of the Claret Sword support is Abyss Summoner, a Grade 1 who gains +3000 power every time one of your other units is retired due to an effect of one of your unit’s abilities, though only if you have a Claret Sword Vanguard. His usefulness doesn’t stop there. As well as the power boost, you also Counter Charge and Soul Charge 1 when those units are retired. Now we go onto the path of nostalgia with some of the new Royal Paladin cards. I’ll start with everyone’s favourite pink dog, Flogal who, despite originally only being a stand trigger with no additional abilities, left quite an impact on many players. 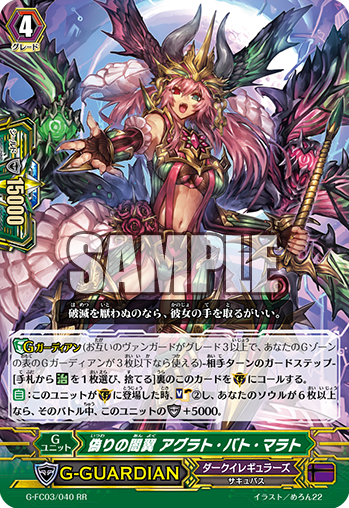 Her new for, Floral Paladin, Flogal, is now a critical trigger who also has the power of a stand. 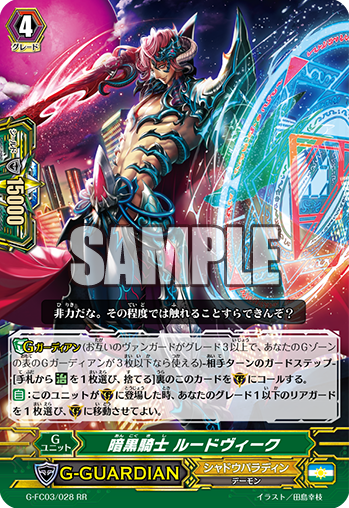 When Blaster Blade attacks, at the end of his battle you may Counter Blast 1 with Flogal’s skill to stand up a Blaster Blade on a rear-guard circle and afterwards you must put Flogal back into the deck and shuffle. As well as Flogal there is also a new Grade 1 version of Barcgal named Blaster Friend, Barcgal. Whenever Blaster Blade is placed in the same column as Barcgal, if you have a Blaster Vanguard then you Counter Charge 1. This will really help to nullify Flogal’s cost as well as essentially being able to half Blaster Blade’s on-call ability. Favorite Disciple of Light and Darkness, Llew is the last of the nostalgic trio. When he is boosted by either the new Flogal or Barcgal then he gets an extra +3000 power for the battle. He also gets an ability to Counter Blast 1 and put him into the soul after the battle that he attacked a Vanguard to superior call a Grade 2 Blaster from the deck and that new unit gets +3000 power for the turn. Lastly for Royal Paladin is the new Brave perfect guard, Hope Keeper. When Hope Keeper is placed on a rear-guard circle and is Brave she gains +2000 power making her an 8k booster, also at the end of the turn you can Counter Blast 1 to return her to your hand. This is a bit of an awkward card to use but it can make for a good final push and if everything goes wrong then you still have a perfect guard to use next turn. Onto Granblue we have the Glimmer Breath clone who is extremely useful for Nightrose. When Witch Doctor of Languor, Negrolazy is placed on a rear-guard circle you can Counter Blast 1 and Soul Blast 1 with a Generation Break 1 to call a Grade 2 or less from the drop zone that doesn’t share the same name as Negrolazy and Negrolazy gains +2000 power. If Negrolazy is also Hollowed then when we would retire due to Hollow you can Counter Charge and Soul Charge 1, essentially nullifying the cost of the superior call. A great unit to call with Negrolazy would be Witch Doctor of the Bone Powder, Negrobone. With a GB1 at the end of the battle that Negrobone boosted a rear-guard you can Counter Blast 1 and retire that unit to put any card with Hollow from your drop zone onto a rear-guard circle. You need a Nightrose Vanguard but having this boost Ruin Shade until you have the right cards in your drop zone can be a good way to get extra attacks and get things out like Negrolazy to bring even more units out. We also get an upgrade from Gust Jinn with the new perfect guard G, Tornado Jinn. This is the non-Hollow version of the perfect guard G so it will give you a Counter Charge and Soul Charge as long as there is another version of him in the drop zone which can help with the new high-cost units like Mist Phantasm Pirate King, Nightrose. As well as all of that there are (What seem to be) a couple of vanilla triggers. The critical trigger Assault Command, Carignan and the heal trigger Charming Banshee. There is one last card to talk about for this set which is a little Grade 1 Cray Elemental. Due to problems G decks have had when they’re against people stalling on Grade 2 (Ripples have shown to be a truly fierce threat with this kind of strategy) it leaves G decks basically a deck full on vanillas… well Air Elemental, Twittern is here to help out all those G decks. If you have no face up cards in your G zone and you are on Grade 3 with your opponent not placing any card on their Vanguard circle in their previous turn then you can rest Twitterun and put him face-up in your G zone and gives you a draw. This gives you the GB1 you need to stopping your deck from becoming a big vanilla-y mess. 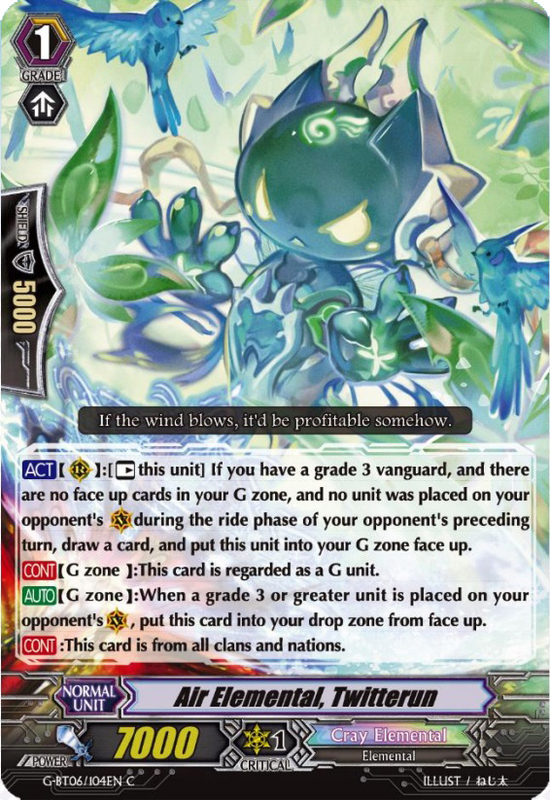 This won’t give you a permanent GB boost because when your opponent rides a Grade 3 you must put Twitterun into the drop zone but it won’t matter at that point because you’ll finally be able to stride! A couple of the Fighter’s Collection 2016 cards have already been revealed. The first one being Super Cosmic Hero, X-phoenix. When X-phoenix has 35000 power or more and his attack doesn’t hit, you may Counter Blast 1 to draw a card. This doesn’t seem like much but it’s very easy to get him to that power level and getting card advantage on your first stride isn’t bad. He’s not the greatest stride in the world but it may be good to run one as a backup. It could be good if you know your opponent has a perfect guard in hand, that way you’re not losing out too much when it doesn’t hit. 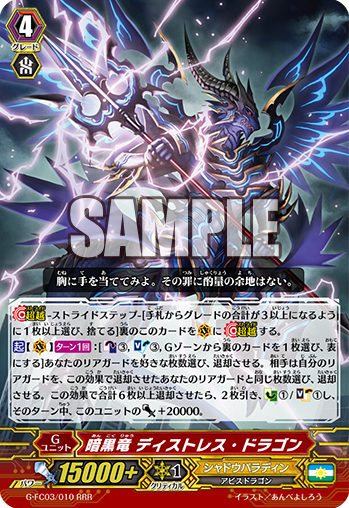 The Narukami stride is Conquering Supreme Dragon, Voltech Zapper Dragon. When you have a Thunderstike of 3 and Voltech attacks he gains +10000 power and the ability to Counter Blast 1 at the end of the battle to force your opponent to retire one of their rear-guards for every two cards in their bind zone and bind the newly retired cards. This definitely seems to be the better stride of the two shown cards but whether their rarities are the same has yet to be shown. That is all for this week’s reveals. Hopefully there was some support that you have been eager for, perhaps the Blasters or “Diablo”, or maybe you were more interested in the amazing new Granblue cards. They are shaping up to be a powerful clan indeed, but we are sure to see some more great cards next week!